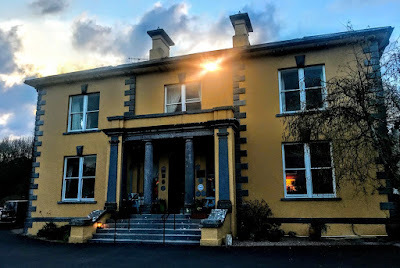 I had dinner this weekend at the Mustard Seed in Ballingarry, Co Limerick. The Mustard Seed at Echo Lodge is on a small hill overlooking the village of Ballingarry, nestled in the heart of the Golden Vale, south of Adare and Rathkeale. Guests at this country house, with its own unique ambience, can enjoy the tranquillity, fresh country air and walks in the surrounding hills and lanes. Sitting on acres of manicured lawns, orchard and a working kitchen garden, this heritage hideaway is the only Blue Book Country House in the Limerick countryside. It is surrounded by country lanes for leisurely strolls and close to the Ballyhoura Mountain range for more organised trails. The house looks across at Knockfierna, the highest peak in the landscape of the Mid-West, offering the perfect trek for even the amateur walker. It is also close to Lough Gur, one of Ireland’s finest archaeological and historical gems. The house was once known as Echo Lodge, and until the mid-20th century the house was home to Saint Mary’s Convent of Mercy and with an adjoining school. This is an impressive, substantial country house with a symmetrical form, solid massing and is articulated by the finely cut limestone quoins. Father James Enright began building the Roman Catholic parish church in Ballingarry the 1870s, before he was moved to Parteen in 1874. The church was completed by Father Timothy Shanahan. He found the parish priest’s house in Ballingarry, built by Father Enright, was so large that he decided it would be more suitable as a convent, and he brought the Sisters of Mercy to Ballingarry from Abbeyfeale. Echo Lodge was built in 1884 as a three-bay, two-storey house, with a recessed centre-bay. Today it has a portico at the front or south-east, bay windows on the south-west side and first floor. In addition, the house has recent multiple-bay extensions behind on the north-west side, and on the north-east side that provide hotel accommodation. The hipped slate roof has overhanging eaves, timber brackets and there are rendered chimneystacks. Lined-and-ruled rendered walls having limestone quoins and plinth course. Square-headed openings with bipartite one-over-one pane timber sliding sash windows having render keystones and limestone sills. Square-headed openings to bay windows and rear elevation having one-over-one pane timber sliding sash windows and limestone sills. The round-headed windows to north-east side have one-over-one pane timber sliding margin sash windows and limestone sills. The round-headed openings at the portico, the south-west and north-east sides have fixed windows and limestone sills. The portico has limestone Doric columns supporting a carved frieze with an inscription and an entablature, with flanking render Doric style pilasters. A flight of limestone steps leads up to the front doors entrance. The pillared portico of the present house provides a decorative focus, and it is said it limestone columns were salvaged from nearby Grove House in the 1960s. Grove House was probably built around 1814 by Colonel William O'Dell, MP, and it was later used as a workhouse before its eventual demolition. 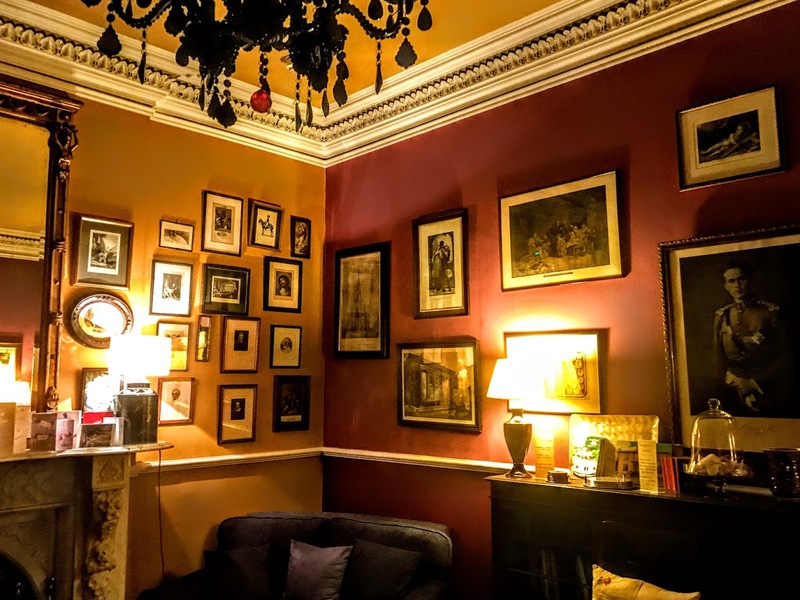 Echo Lodge is a well-maintained Victorian country house and it retains much of its early form and character, as well as many important original features including the slate roof and timber sash windows. 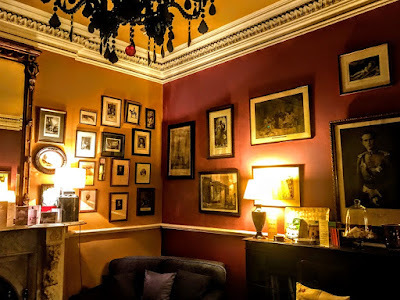 We were there thanks to a generous and thoughtful gift and we were welcomed by John Edward Joyce, the General Manager, to this legendary restaurant with its warm, welcoming open fire, its warm hospitality and its superb food. We had a table at the front window, and for starters we had risotto with blue-berried beetroots, fennel, blue cheese and pumpkin seeds; and salmon with gravlax yuzu, pickled squash, onion, yoghurt espuma and coriander oil. Our intermediates were a salad of organic leaves with tomato and chili dressing, mushroom and wild garlic soup. Our mains were Ravioli with leek and parmesan, spinach, artichoke crisps and king oyster mushrooms, and John Dory, with spinach, shitake, cauliflower and yoghurt purée and cockles. 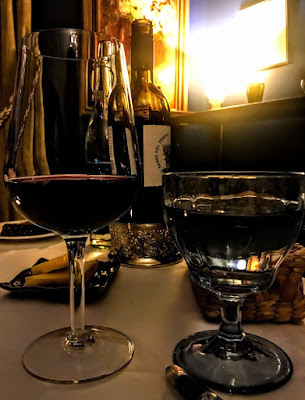 It was all accompanied by a bottle of Passo del Tempio from Sicily, and followed by coffee. The Mustard Seed is celebrating over 30 years of food and hospitality since 1985. Its recent awards include: Host of the Year, Georgina Campbell 2019; Best Customer Service, RAI 2018; Best Front of House Team, Yeschef 2018; One Fab Day 100 Best Wedding Venues, 2018; outstanding Guest Experience, Georgina Campbell; Best Customer Service, Food and Wine Magazine Hideaway of the Year, Georgina Campbell; and Pet Friendly Hotel of the Year, Georgina Campbell.